Nothing gives neuroscientists fits like amnesia thrillers. They basically come in two speeds. Most of the films will devote much of their set-up to meticulous psychotherapy, but the third act inevitably down-shifts into a restorative bash to the noggin. Unfortunately, this beleaguered man with memory loss will not be receiving any of the former in Michael Polish’s Amnesiac (trailer here), which opens tomorrow in Los Angeles. The unnamed man has a lovely wife, but her bedside manner is a little off. Apparently, she is a veterinarian, but that only partially explains it. He doesn’t really know what her problem is or what her name might be. However, he can still pick up on her bad vibes. She seems darned determined to start a new family, but the man has a feeling they already have a perfectly good daughter—or at least they did before the accident that put him in the position. He has a bad feeling about what happened that fateful day, but we expect the truth will be even worse. While Amnesiac will never make anyone forget about Spellbound (a tough film to top, since Hitchcock and Dali will not be working on anymore collaborations anytime soon), it still manages to put a few new spins on the amnesia thriller, all made possible by one of the laziest cops you will ever find outside of New Jersey. It becomes more of a cat-and-mouse game than a psycho-babbling psychological thriller, but it has a potent trump cards stashed up its sleeve. Amnesiac is worlds removed from Polish’s underrated Big Sur, which also co-starred his future wife, Kate Bosworth. 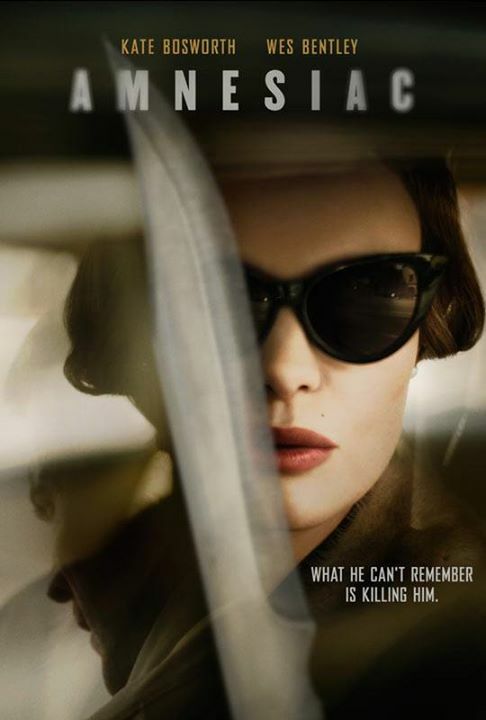 Although it was written by screenwriters Amy Kolquist and Mike Le, Amnesiac seems like a strange project for a happily married couple to take on, but at least it gives Bosworth the opportunity to channel her inner early 1950s Bette Davis with a severely chilly lead performance. She sort of hits the same note over and over again, but it is an impressive note. Poor Wes Bentley just gets the living stuffing kicked out of him as the unnamed man, but he sells the big revelations relatively well. Amnesia is a strangely disconcerting film that appears to exist outside of time thanks to the way Polish blends 1950s imagery with more contemporary trappings. Yet, somehow it seems to work in the context of the film. It is a nice bit of noir film making, but it is the sort of film the head appreciates more (for the ways it successfully plays the viewer) than the heart. Distinctive in its way, Amnesiac is recommended for psycho-captive thriller fans when it opens tomorrow (8/14) at the Arena Cinema in Los Angeles and also launches on iTunes.